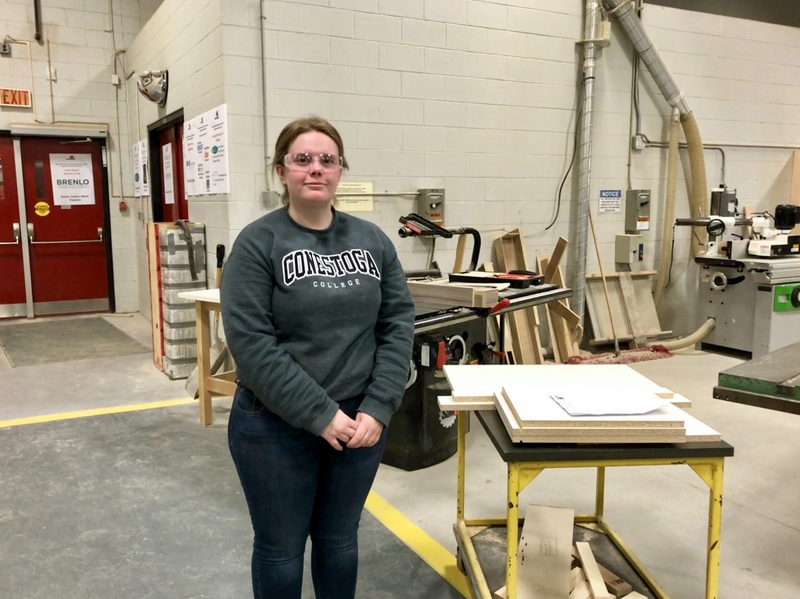 Jennifer Norman, a level 2 student in Conestoga’s Cabinetmaker Apprenticeship program, placed first at the 2019 Architectural Woodwork Manufacturers Association of Canada (AWMAC) Ontario Apprenticeship Contest held on March 23. Hosted this year at the college’s Woodworking Centre of Ontario, the annual competition welcomes students, apprentices and recent graduates from post-secondary cabinetmaking programs. Conestoga Cabinetmaker Apprenticeship student Jennifer Norman finished first at the 2019 AWMAC Ontario Apprenticeship Contest. Participants were given a total of nine hours to manufacture a small cabinet according to strict drawings and specifications, including a door and functioning drawer. Industry experts judged projects on machining skills and accuracy. Norman’s cabinet will represent Ontario at the national contest in British Columbia in late May where her work will be judged against other provincial winners. Norman was also rewarded a $500 prize as part of her first place finish. AWMAC is the national voice of the architectural woodwork industry in Canada. Serving more than 400 members in eight chapters across the country, the association provides programs and services that assist all members of the construction team. At approximately 52,000 square feet, Conestoga’s Woodworking Centre of Ontario is the largest facility of its kind in North America and ranks among the world’s top woodworking training centres. Students have access to custom woodworking and production training as well as the latest in Computer Numerical Control (CNC) and computer drafting technology.